You may know about Cloud Server already because it becomes more popular now. But before moving everything in your current dedicated server to a cloud server, you should consider and play with some cloud server providers to make sure you clearly understand how to manage and control it. With a cloud server, you can easily upgrade or downgrade your server capacity (CPU, RAM, HDD, etc) and remove or install applications you want to run in there. In addition, with cloud server, you just pay only what you use; usually cost per hour depend on your hardware configuration (ex: CPU, RAM, HDD) and monthly fee for Windows Server OS or some license software. That’s all for introducing about cloud server as you are may an expert already. Now the time to talk about something free for your testing with Cloud Server. Atlantic.net is one of my partner that support a Free trial with Cloud Servers (No Contract & No Commitments). 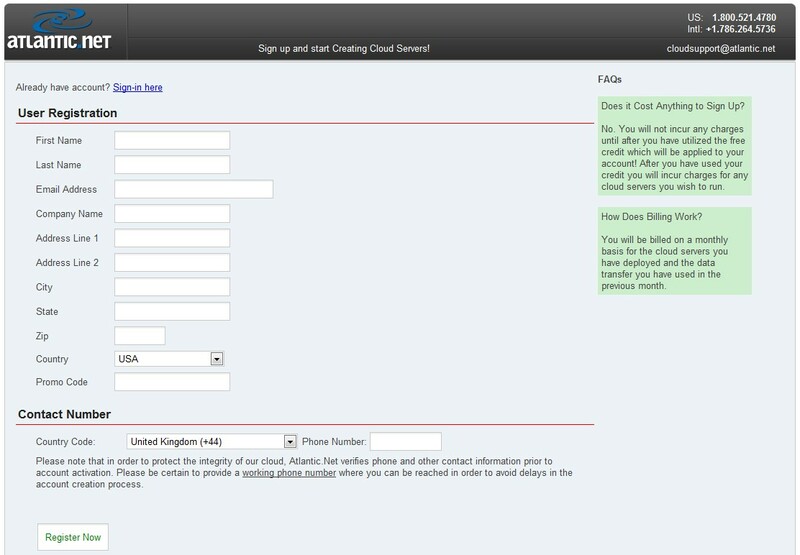 Simply create an account in atlantic and start getting experience with Cloud. You just pay if you feel happy. Note: They will verify your phone number prior to account activation; therefore you should provide a working phone number in order to avoid delays in the account creation process.